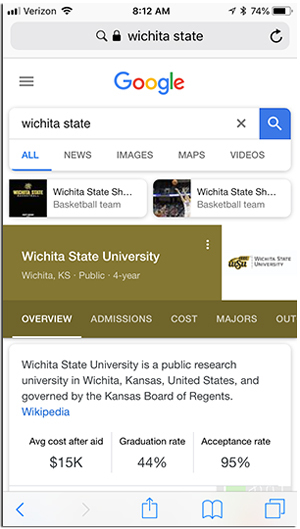 Google now offers access to details about college when somebody looks up a specific institution in the search engine. The company announced the update to its results screen in a Google product blog story. According to Product Manager Jacob Schonberg, when a user enters a college name, he or she will receive the usual capsule description from Wikipedia, as well as a menu with quick links to information about admissions, cost, majors, outcomes and other aspects and other stats. The results tap into data maintained in the U.S. Department of Education's College Scorecard and Integrated Postsecondary Education Data System (IPEDS), a data set covering four-year colleges. The initial rollout focuses on mobile search with a few features on the desktop, said Schonberg. The results give instant information about the average cost of the school after aid as well as graduation and acceptance rates. Choosing "students" in the menu gives the latest IPEDS enrollment data and breakdowns by full-time and part-time, race, gender and income, as well as the share of students who are Pell grant recipients. A link to "similar colleges" brings up a page displaying thumbnails of schools in the same geographic location. Choosing "rankings" brings up the institution's position in a number of college ranking lists. Two-thirds of prospective and recently enrolled people say they've "often felt lost when researching college or financial aid options," wrote Schonberg. "That's why we're bringing a new feature to Search to help you navigate the college search process."